PONTE VEDRA BEACH, Fla. -- A 48-foot section of an old sailing ship has washed ashore on a Florida beach, thrilling researchers who are rushing to study it before it's reclaimed by the sea. The Florida Times-Union reports the well-preserved section of a wooden ship's hull washed ashore overnight Tuesday on Florida's northeastern coast. According to CBS News affiliate WJAX-TV, Julie Turner and her 8-year-old son found the wreckage on Ponte Vedra Beach Wednesday morning. 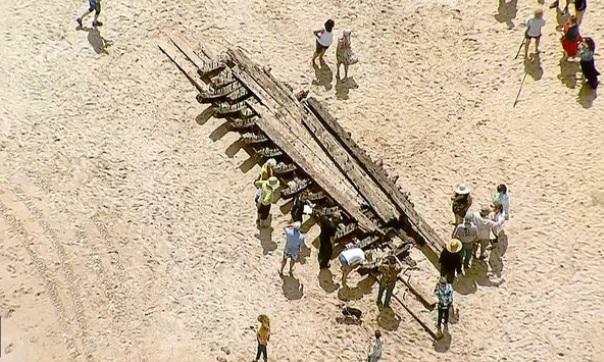 At first, Turner thought it was a piece of a pier or fence, but then, she realized it was a centuries-old ship that had washed ashore. "We walked and checked it out and immediately knew it was a historical piece of artifact," she told WJAX-TV. Researchers with the St. Augustine Lighthouse and Maritime Museum have been documenting the artifact and say it could date back as far as the 1700s. Marc Anthony, who owns Spanish Main Antiques, told WJAX-TV it's extremely rare for wreckage to wash ashore. "To actually see this survive and come ashore. This is very, very rare. This is the holy grail of shipwrecks," Anthony said. Museum historian Brendan Burke told the newspaper that evidence suggests the vessel was once sheeted in copper, and that crews found Roman numerals carved on its wooden ribs. Researchers rushed to photograph and measure the wreckage. The photos will be used to create a 3-D model. WJAX-TV reports it's up to the state to decide what to do with the wreckage.